A classic pairing is caramel and popcorn. From Cracker Jacks to caramel corn it has been a favorite snack through the ages. We try to help you recreate these dishes at home with our caramel corn recipes and other caramel popcorn recipes. Many of these caramel corn recipes include homemade caramel sauces but you can also use store bought at well. Sometimes the caramel has flavor additions and in those cases it can be best to make them from scratch. 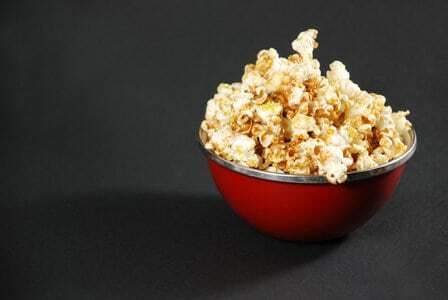 The addition of unique flavors is one of the biggest benefits of homemade caramel corn and homemade caramel popcorn. From sweet additions like cinnamon or maple sugar to savory flavors like rosemary, chile peppers, or even curry, these additions are what make many of these caramel corn recipes so wonderful. The other benefit to homemade caramel corn is that you know exactly what is going into your caramel. You do not have to worry about any additives or other things that might not be healthy for you. To help you create your own homemade caramel corn we've researched it on the Internet, in popcorn books , and with our own experience to bring to you the best caramel corn recipes we could find! Hopefully you can now enjoy the best caramel corn recipes around! Adding sticky, sweet caramel to hot popcorn is just a great way to make a snack! Caramel corn goes way back in the history of snacking and our homemade caramel corn recipe will get you started making this great treat at home. There are many different kinds of caramel popcorn recipes this butter toffee popcorn recipe is one of the best. The butter toffee coats the popcorn in a crunchy, sweet shell that is just wonderful. Plus it's easy to make at home!